What brought me to this point you ask? I know that this might sound like it is stolen from Dr. Seuss and I suppose it is, but I think that inspiration does not come in a can. It is not something that you go to the store to pick up and suddenly everything is prepared. At least, it really is not that sudden for me. There were many people which brought me to the point of buying land and deciding on a tiny house. Some of it had to do with simply wanting to have a place to go when I go home; but it is not just a home, it is a little bit more. There were a lot of people who inspired me to be thoughtful about what I would do on my land, when I finally got it, here is the list as I see it. Grandma and Grandpa, Leslie and Mabel. Who taught me to love history and who taught me about the people from where I came. Dad, Richard. He taught me to love the land and know the plants and seasons of the area where I came from. Erazim Kohák. Who wrote about what it means to understand and love the land. 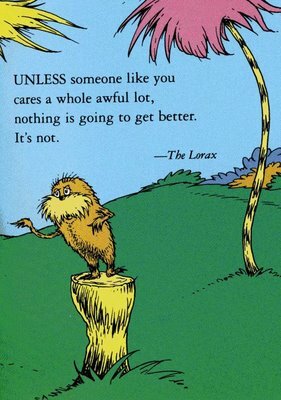 Dr. Seuss, the Lorax: Who taught me that the planet is more important than thneeds. Grandpa and Grandma, Bob and Violet: Who taught me that farmers are the most important people in the world and deserve to be respected for the years of education that they receive on the farm. Indeed trained from infancy, groomed to work and to know the land, and consequently the most educated people we have in the world. Still, sadly, so many imagine that this earned education to be less than what is paid for at university, that this education is somehow unimportant because it is simply passed down and along. Absurd that farmers are and continue to be some of the most marginalized in our society. My cousin Andrea and her husband Orrie: Who live the life of the Lorax, every moment on their bio-diverse, organic farm in Inverary, Ontario. They have each taught me so much about living the good life, that I cannot begin to tell you what I have taken from them and their friends and followers. Of course then there is Jay Shafer, who, though I have never met him showed me how to live big in a small home. Lastly, and most importantly, I have to say that my husband, HJ, is the one who works to make this all possible! He supports my philosophical and artistic hopes, even though I left him for six months this summer to chase and build this dream. HJ is as solid as the giant rock escarpment that I built the tiny house on. These people were my major inspirations. a very solid group indeed! Ah Jim! Thank you! I am glad that you stopped by! I look forward to your visits with your guitar next spring when I am living there again. You know, I still have the string holding thing held hostage there. I will be there with HJ winter camping Friday night, if you need it – Saturday my buddy Kev is having a bit of a birthday thing at the Mansion and then back here again… let me know eh?